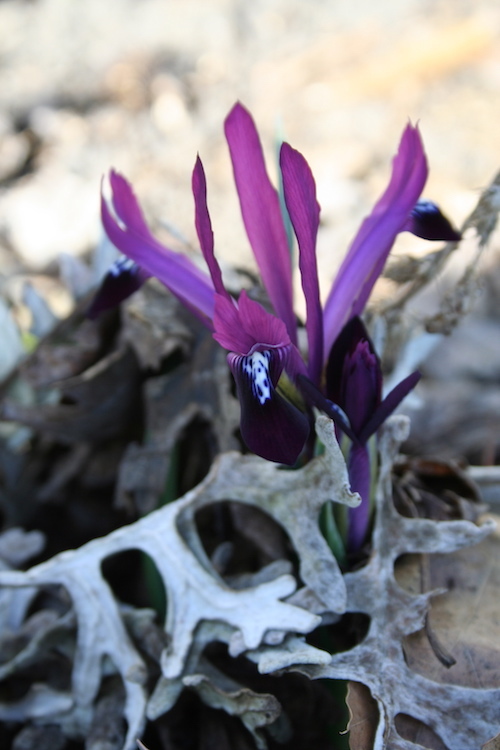 Iris reticulata blooms amid the spent foliage of a dusty miller plant. The seasons are changing rapidly here — and, in true Minnesota style, changing back. We went from mid-60s much of last week to mid-30s today. Sunday I spotted the first bloom in our front yard. It is an Iris reticulata, an early blooming bulb that usually comes up about the same time as crocuses. (The timing is right on. My neighbor’s crocuses are also blooming.) It’s one of those plants I have no recollection of planting — so each year, it’s a pleasant surprise. I love the deep purple color and the little polka dots on the bloom. What’s blooming in your garden this chilly day? « Are Ugly Gardens a Feminist Issue? It pains me to say it: absolutely nothing. But a blindingly lovely cover of snow about two or three feet thick is covering everything, so we’ll see how long that takes to melt and then maybe I’ll be in business as far as blooms go;) Your iris is very cheerful. ‘Ladykiller’ is leading the crocus parade here in northeastern Minnesota. You can see photos at sillydoggarden.blogspot.com. One of my phlox decided to bloom (one flower.) It is really early – I normally do not see anything of my phlox until May Day in Minneapolis.